Great Falls Dodger Ernie Carr heated up against Medicine Hat pitching in June 1988, according to The Medicine Hat News. Carr went 2 for 4 with a home run in one game and 3 for 5 with another home run in the next, The News wrote. "I was 0-for-7 at the start of the year but I was hitting the ball hard," Carr told The News after the second contest. "Now they are starting to drop in for me." Enough balls dropped in for Carr to hit .333 that year in rookie ball. He went on to play in two more seasons before injury prematurely ended his career. Carr's career began that year in 1988, taken by the Dodgers in the 26th round of the draft out of Jacksonville University. Carr played his high school ball at Platt High in Meriden, Conn. A former teammate at Platt later compared Carr favorably to Jeff Bagwell as the most talented players he'd seen in person. At Jacksonville, Carr earned All-America honors in 1988. He hit .440 and recorded 32 doubles to lead the country. He earned conference Player of the Year in 1988 and later entered the school's Hall of Fame. Carr started with the Dodgers at rookie Great Falls. He hit four home runs and knocked in 62 to go along with his .333 average. He walked in a September game, but was thrown out later at the plate. 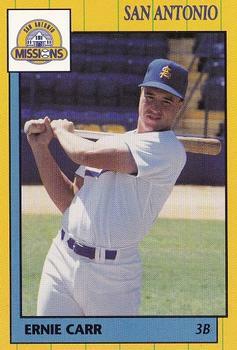 Carr moved to single-A Bakersfield in 1989. He hit .254 in 132 games, with nine home runs. He hit one of his home runs in a September contest. He arrived at AA San Antonio for 1990. He got into 72 games, hit .260 and knocked in 21 to end his career.